This past May, along with the release of the small fragment formerly known as “First Century Mark,” (P137) two other New Testament papyri were released: a fragment with text from the Gospel of Luke (P138), and a fragment with text from Paul’s Epistle to Philemon (P139). The Egypt Exploration Society kindly provided interested persons with access to images of the fragment of Mark, and a picture of Oxyrhynchus Papyrus 5347 – the fragment from Philemon – is on the same page. The images show text from verses 6-8 and 18-20. Without consulting the transcription offered by the editor of P139 (Notre Dame professor Dr. David Lincicum), I have attempted a transcription of it. For the official transcription, made by someone who could study the papyrus directly, you will need to consult Volume 83 of The Oxyrhynchus Papyri – Graeco-Roman Memoirs, a publication of the Egypt Exploration Society. The script is consistent with a production-date in the 300s, which means that this papyrus is one of our three earliest Greek manuscripts of Philemon (ranking behind P87 and more or less tied with Codex Sinaiticus). ● v. 6 – υμειν confirms the reading εν υμιν (with an inconsequential spelling-difference), and this might tilt the balance of evidence away from εν ημιν, the reading that is presently read in the Nestle-Aland Novum Testamentum Graece. ● v. 6-7 – My reconstruction of the second line is very tentative. Somewhere in the non-extant text, space-considerations seem to support the non-inclusion of Ἰησουν (even contracted as a sacred name). ● v. 7 – P139 definitely supports πολλην εσχον, not εχομεν πολλην. ● v. 7 – There may be a raised dot between σου and οτι. ● v. 8 – Where there should be an ο in πολλην, P139 appears to have an ε. ● v. 18 – τουτο appears to have been written as τοουτο. ● v. 19 – The last visible letter in the fourth line could be an ε or a smudged ι. 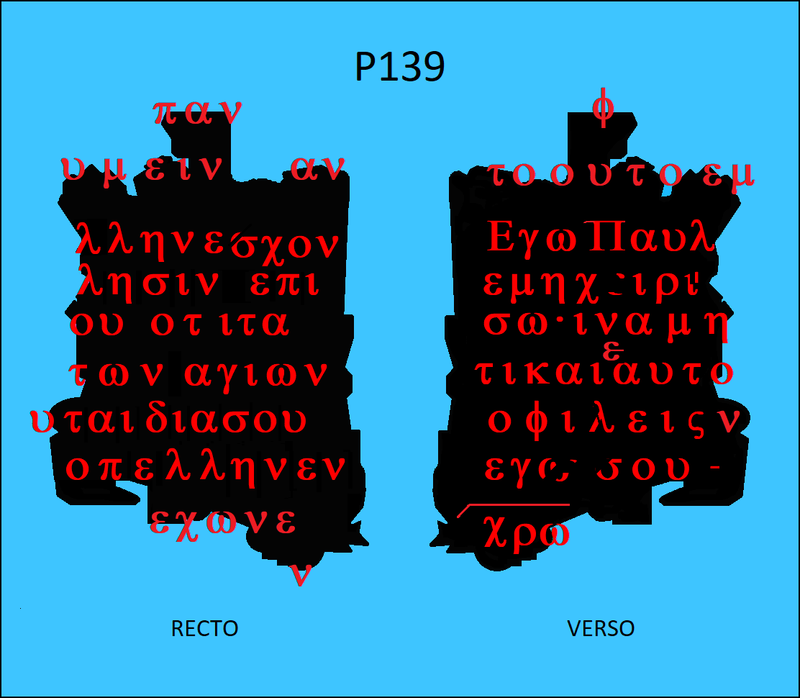 ● v. 19 – Instead of the usual reading σεαυτόν, P139 reads αυτον, and ε has been added above the α, so as to support εαυτόν. ● v. 19 – A slight orthographic variant, ι instead of ει in προσοφείλεις, is supported by P139. This spelling (without the ε) is also supported by Codex Sinaiticus, Codex Alexandrinus, and by Codex Claromontanus (which doesn’t have the ε after the λ, either; a corrector has inserted it). This is of course only a preliminary reading based on a black-and-white photograph. After completing my own transcription, I checked it against the transcription in Oxyrhynchus Papyri Volume 83, and although there are some disagreements between my work and that of Dr. Lincicum, I was satisfied with how my transcription turned out. Readers are encouraged of course to consult the official transcription. James, where did you get a copy of Oxyrhynchus Papyri Volume 83 from to check your transcription against? A Moment Please, Dr. Holmes! "First-Century Mark" - Finally! But . . .
N-A in 2018 and W-H in 1881: How Similar?